Due to military necessity, places of residence and business of stateless refugees in the Shanghai area shall hereafter be restricted to the under mentioned area in the International Settlement. East of the line connecting Chaoufong Road, Muirhead Road and Dent Road. North of the line connecting East Seward Road, Wayside Road and South of the boundary of the International Settlement. 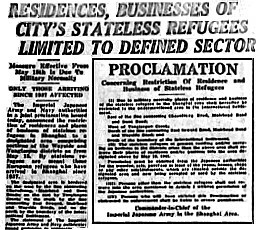 The stateless refugees at present residing and/or carrying on business in the district other than the above area shall remove their places of residences and/or business into the area designated above by May 18, 1943. Permission must be obtained from the Japanese authorities for the transfer, sale purchase or lease of rooms, houses, shops or other establishments, which are situated outside the designated area and now being occupied or used by stateless refugees. Persons other than stateless refugees shall not remove into the area mentioned in Article I without permission of the Japanese authorities. Persons who violate the PROCLAMATION or obstruct its reenforcement shall be liable to severe punishment. Imperial Japanese Army in the Shanghai Area.